↑ 1.0 1.1 "Official Languages Act 2003". Office of the Attorney-General. पहुँचतिथी 18 फरवरी 2012. ↑ "CSO 2011 Census – Volume 5 – Ethnic or Cultural Background (including the Irish Traveller Community)" (PDF). 2011. पहुँचतिथी 9 July 2009. ↑ "Census of Population 2016". 14 July 2016. 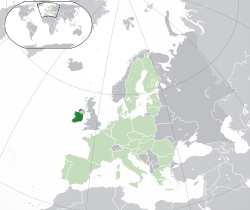 ↑ 4.0 4.1 4.2 4.3 "Ireland". International Monetary Fund. पहुँचतिथी 17 अक्टूबर 2016. ↑ "Gini coefficient of equivalised disposable income (source: SILC)". Eurostat Data Explorer. पहुँचतिथी 4 दिसंबर 2015. ↑ John Coakley (20 अगस्त 2009). Politics in the Republic of Ireland. Taylor & Francis. प. 76. ISBN 978-0-415-47672-0. पहुँचतिथी 2 मई 2011.